Cobbett: agitator for all seasons. When we consider the subject of civil disobedience, especially in the context of the United Kingdom, the mind is liable to fix on the astonishing figure of William Cobbett. For defiance of that unjust oppression of men speaking their minds, which today descends most readily on those who defy the liberal orthodoxies on sexual ethics, has few better exemplars than Cobbett. 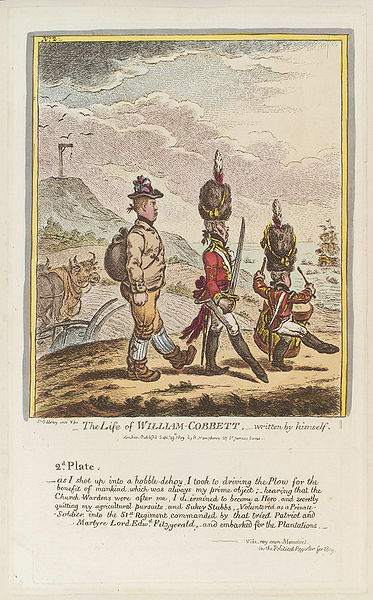 As an anonymous stylist at La Wik puts its, aptly, “Through the seeming contradictions in Cobbett’s life, two things stayed constant: an opposition to authority, and a suspicion of novelty.” Have we here a Left-Conservative, a Radical-Reactionary? A left-wing conservative reactionary? Whatever label we might favor, with Cobbett we are in the presence of a great-souled man. His writings are invariably a challenge that rewards to read. He surely was a challenge to get along with, but he loved with a true heroism that inspires. Consider this: the man had enough flashing heroism to appeal to all the Contributors at this blog. That is saying something, for we are a hard-headed and contentious lot. He was a sturdy traditional Anglican (Lydia), who set down a polemic against the Reformation so vigorous that my antique addition features an enthusiastic introduction by a Roman Catholic cardinal of the Church (Jeff, Zippy, Ed, Mike). He was a brilliant expositor by word, and hard worker at by deed, of the farmer-legislator as the root of sanity in the commonwealth (Maximos, Zippy, me); but he was also a careful and loving explicator of the English language and its grammar (Bill, Steve, all of us). He opposed much of the structure of the British mercantilist system, and heavy taxation and government meddling in general (Steve, Lydia, Ed). He set his lethal pen to work against Thomas Malthus and his early adumbrations of demographic doom which later underpinned the Eugenics movement (all of us). Other W4 readers would no doubt take readily to his strictures against paper money. Not a few of our liberals (who, being broadminded members of that class, may be capable of transcending the narrowness of their creed) will thrill to his various protests for the poor — all those souls, in Johnny Cash’s phrase, “living on the hopeless hungry side of town.” His greatest political achievement was, after all, the Reform Act of 1832. Indeed, I do not think it presumptuous to conjecture that the Man in Black, singing to the “the prisoner who has long paid for his crime,” or singing for “the poor and the beaten down” and above all for “those who’ve never read or listened to the words that Jesus said” — I do not think it presumptuous to say that the Man in Black was a protest worthy of Cobbett. Would that old England raised up men like Cobbett again! The man was a born agitator, a provocateur of merry genius, in the pattern of the jugglers of God. He would probably arrive at the anti-globalization rally and preach the Gospel and especially its application in the virtue of chastity to those stunned anarchists; and then arrive at church to raise the alarm among Christians on the horrors of the plutocracy at the City of London. You can add down-to-earth practicality in his "Advice to young men" about how to be industrious, what to look for in a wife, etc. Cobbett said some things worth reading. Yet he was also a leftist was obsessed with Thomas Paine. And his interpretation of British history was rubbish. But he was anti-protestant, so this made him a hero with Catholic bigots and social justice cranks. In many ways, William Cobbett was the Michael Moore or the Howard Zinn of his time. Can you present some backup for the claim that his history was rubbish? I have to say the Paine thing bothered me. There's something very odd about a person's values if his ambition at the end of his life is to return Paine to England for a hero's burial. Say what? Paine was a rabid enemy of Christianity and a shallow, ridiculous one to boot. An ignorant coxcomb who pulled the wool over his readers' eyes. Why should a Christian wish to honor him? Um, no, Grobi, that's not why. It's because he was an ignorant fool yet pretended to be wise about the history of Christianity. Lydia-I won't pretend to be a Cobbett expert. I've got a generally positive impression of him but the Paine fetish always left me scratching my head. Maybe our hindsight vs. Cobbett's contemporary knowledge of Paine accounts for the discrepancy. Or maybe Cobbett just had a few bats in his belfry. James Vandenberg-Still waiting for some backup. There is no sharp break in his life, breaking the very backbone of his principles; such as there is in the life of a penitent or the life of a traitor. It is not true that he belonged successively to two parties: it is much truer to say that he never belonged to any. But in so far as there were elements of the Radical in him at the end, there had been traces of them from the beginning. And in so far as he was in one sense a Tory at the beginning, he remained a Tory to the end. The truth is that the confusion was riot in Cobbett but in the terms Tory and Radical. They are not exact terms; they are nothing like so exact as Cobbett was. His general position is intrinsically quite clear and, as men go, quite consistent. It was the Tories who were not clear about Toryism. It was the Radicals who were inconsistent about Radicalism. I do not mean that he had no inconsistencies; he had a great many. He had all those inconsistencies of mere verbal variation which are almost invariable in a man who throws himself with equal vehemence into the proving of many different propositions in many different connections. But the inconsistencies of Cobbett were very superficial; much more superficial than the changes in most political careers. The man who played Peter Porcupine in America did not differ so much from the man who brought the bones of Tom Paine like holy relics to England as the Disraeli of the Revolutionary Epick differed from the Disraeli of the Primrose League, or the Gladstone who was the hope of the stern and unbending Tories from the Gladstone who was the idol of the Radicals and Nonconformists. Cobbett was a very consistent man, in every essential sense. It was the parties claiming or repudiating him who were quite inconsistent. When I come to speak of the measures by which the monasteries were robbed, devastated and destroyed in England and Ireland, I shall show how unjust, base and ungrateful, this railing against them is; and how foolish it is besides. I shall show the various ways in which they were greatly useful to the community; and I shal especially show how they operated in behalf of the laboring and poorer classes of the people. Those who recur to Locke or Adam Smith or any of the lesser English expositors of capitalism would do well to remember the social state from which their analysis derived. Yes there is plunder and crime in all enduring human things; but you wouldn't ever know from the way folks talk today that there was a staggering plunder and crime at the origin of the political economic system which appears near the extremity of endurance right now. Real conservatives from Burke to George Washington to Father Coughlin have a love of the common working man. The very rich, the idle poor, and the very powerful arouse their suspicions. You're not going to start in on the Jews again, are you, Roach? You brought up the Jews, not me. Father Coughlin had other topics of interest, not least the dangers of unrestrained capitalism and unrestrained socialism. To the extent Jews came up in those discussions, he mentioned them, but I suggest you acquaint yourself with his works before you start accepting the left's characterization of him. Father Coughlin had other topics of interest, not least the dangers of unrestrained capitalism and unrestrained socialism. And who for Father Coughlin was behind unrestrained capitalism and unrestrained socialism? Yet he was also a leftist was obsessed with Thomas Paine. And Chesterton praised the French Revolution. Even Homer nods.